I have to admit that I have been a bit lazy with blogging lately. I actually have quite a few card made up ready to go but with the chaos and excitement of going to Sydney (the new catalogue of course) and then coming home to house sit for my parents (I am still house sitting) I just haven't had the time or will to blog. That is terrible I know. I should get better at thinking ahead and less procrastinating. So I sat down and decided to have some time out and get creative the other day so I whipped out some white notecards and envelopes. If you haven't seen these goodies you really need to check them out. They are linked at the bottom of this post. Not only are they convenient because they are pre-packed with an envelope but they are also a great size and very affordable! I hadn't yet used this gorgeous Yummy in my Tummy stamp set and I was busting to use it as it was one of the sets that I had really wanted from attending the previous Onstage where this set was released in the Occasions catalogue. 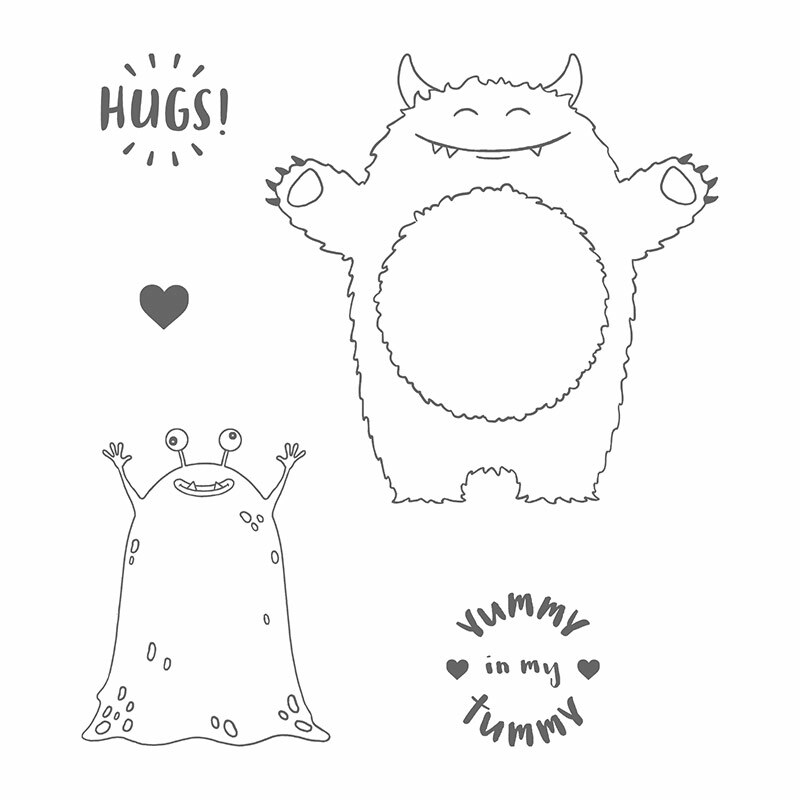 Sadly this set will not be continuing on into the new Annual Catalogue which means that it has been retired so if you want this cute monster, then you need get in quick! As you can see there are five notecards in the set and I have chosen to feature the Tasty Treats designer series paper on the card. I thought it was a matching fit as it also features the bright and fun colours that I was after. I knew that I wanted to make shaker cards as this set is so perfect for that and I really wanted them to be bright, fun and happy! There's nothing like a good cheer up card! Here is a good close up of the shaker part of the card which is easily achieved with the layering circle framelits dies (linked below) I just chose one of the smaller circles to punch out his belly. I then used a larger circle to punch out 2 circles of Window Sheet to hold my shaker bits in. I have used the Sprinkles Embellishments from the Cool Treats range of products from the Occasions Catalogue along with some Dazzling Diamonds glitter to fill the bellies of my monsters! I hope you like this little set of notecards. I am glad that I have a little stock pile of cards here now to send when I need. Keep your eyes peeled as I have been doing A LOT of card making which means I have a lot to share love the coming days/weeks.